There are 52 days left in the PGCBL regular season, which ends on July 30. Adirondack 8 Mohawk Valley 6: The Adirondack Trail Blazers used a four-run fifth inning and some late runs to go on and defeat Mohawk Valley, 8-6. The DiamondDawgs got the scoring started in the top of the third with an RBI groundout. The DiamondDawgs added two more runs in the top of the fourth to take a 3-0 lead. A lone run in the fifth for the visitors made it a 4-0 game before Adirondack got on the board. 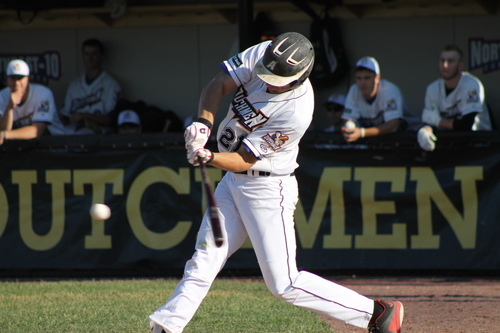 Adirondack scored four runs in the bottom of the fifth, highlighted by an RBI double by Chris Kwitzer. Both teams scored lone runs in the bottom of the sixth and the top of the seventh, respectively, before the Trail Blazers took scored insurance runs in both the seventh and the eighth to seal the win. Tommy Eng picked up the win with three innings of one-run relief while Tom Fazzini notched the save. Blair Lakso took the loss for Mohawk Valley. Saugerties 5 Glens Falls 1: The Saugerties Stallions won their third game in a row on Sunday, defeating the Glens Falls Dragons, 5-1. Both teams scored lone runs on RBI groundouts in the first inning. A Chris Reynolds RBI single in the top of the third put the Stallions up for good. Saugerties added lone runs in the fourth, seventh and eighth to account for its five runs. Jared Tobey tossed six innings of one-run ball to earn the win for Saugerties while Jake Murray allowed three runs in taking the loss for Glens Falls. Utica 9 Victor 2: The Utica Brewers used an eight-run seventh inning to go on and defeat the Victor RailRiders, 9-2, in their home opener. The Brewers jumped out to an early 1-0 lead in the bottom of the first. No more runs were scored until the bottom of the seventh when Utica erupted for eight runs. Dominick Bregar hit a two-RBI single and Alex Core hit a two-RBI double in the inning. Dale Wickham hit a two-run home run in the top of the eighth to account for Victor’s two runs in the game. Michael Messier tossed six scoreless innings to earn the win for Utica while Luke Tomczyk took the loss for Victor. Albany 9 Amsterdam 7: The Albany Dutchmen used a six-run seventh inning to come back and beat the Amsterdam Mohawks, 9-7, for the second time in three days. Amsterdam jumped out to a 6-0 lead in the top of the second, using an RBI double and three RBI singles to score the six runs. Albany scored three runs, including a two-RBI single by Eric Mueller, in the bottom of the sixth inning to lay the groundwork for the comeback. Jack Weiller drove in the first run of the seventh with an RBI single, a passed ball scored the second, a Michael Fitzsimmons RBI single scored the third and an error tied the game at seven. Slayton Vaughan hit a two-RBI single to put the Dutchmen on top. Zak Spivy tossed three scoreless innings of relief to earn the win for Albany while Jake Mielock took the loss for Amsterdam. Elmira 10 Newark 6: A night after Newark beat Elmira in Elmira, the Pioneers returned the favor, beating the Pilots at Colburn Park on Sunday, 10-8. Both teams scored lone runs in the first inning to get the scoring started. Justin Hayes hit a two-RBI triple in the top of the third as part of a three-run inning. The Pioneers scored two more runs in the fourth as Newark scored lone runs in the third and fourth. Newark pulled within one with a two-run fifth inning. Elmira scored insurance runs in both the seventh and eighth innings to make hit double digits on the scoreboard. After scoring one run in the bottom of the seventh, Newark rallied for two runs in the bottom of the ninth, but the comeback came up short as Elmira won the game, 10-8. Tristian Widra earned the win for the Pioneers with five innings pitched and Will Nichol took the loss for Newark, allowing six runs in four innings. Monday is the first of two nights this season in which there are no games scheduled. The other falls on July 13.